This topic contains 2 replies, has 3 voices, and was last updated by fasting_me 10 months, 2 weeks ago. Hi, Jace. 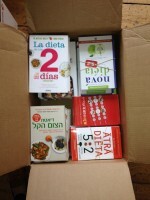 Is one of the books The Fast Diet Book? If not, get it and read it before anything else. It outlines the reasons that Fasting works and how to do it. Fasting is so simple that lots of people think it can’t work because there are no hoops to jump through. You should try this Way of Eating. No doubt you have read several of the testimonials on this Forum, so you can see that it works for many of us. This blog is about Fasting, aka: 5:2 Diet; IF. “I’m not giving up eating!” you sneer. “Fasting is for ascetics who don’t enjoy life.” If you really think that, then I want you to understand that this Lifestyle does involve eating [some really good food] and that there are many benefits beyond weight loss. While on this Lifestyle [WOL], my husband and I have enjoyed lots of delicious food while losing a combined total of 50 pounds. This Lifestyle is sustainable: you can do it week after week, year after year and not feel deprived. What do you eat on the Slow [non-Fast] Days? What you want — WITHIN REASON. Pigging out is not approved, but we go to restaurants and eat all sorts of foods. The key is learning the number of calories that you can ingest [TDEE] to get to the weight you want to achieve. This diet is not about counting calories, but you need to get a realistic sense of how much you are eating daily. Weight loss comes with less food taken in over time and a resulting decrease in appetite. 3. We wrote on the calendar what we would eat on our Monday and Thursday Fast Days. 4. We weighed ourselves and recorded body measurements. And then we jumped in: the first day wasn’t too bad, though we did opt for an earlier-than-usual dinner! And the pounds came off… 9 combined pounds the 1st month, then a plateau, then 16 pounds after 5 months. When we realized that we’d need new clothes for a wedding, we were hooked. Fasting is now a Lifestyle to be continued for years and years. In today’s blog, I am posting the meals we ate on our first day as Fasters: an old favorite Ham Scramble and a recipe from the Fast Diet book itself. Join us for the next 5 years, won’t you?